WE CLOSE ON GOOD FRIDAY FOR THE EASTER BANK HOLIDAY WEEKEND, AND RE OPEN ON TUESDAY 23RD APRIL. We are an established company based in Bromsgrove Worcester., specialising in old school Volkswagen Campervans, Beetles and all other VW models air cooled and water cooled. with over 29 years experience in the trimming trade we have a quality finish to our work which has been showcased in many magazines. Be it leather vinyl or cloth, our services include Headlinings, Camper carpets, car seat trimming, re upholstery of Rock & Roll beds to include new foams. 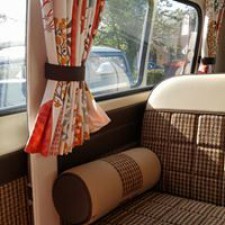 We also have gift vouchers available, so why not treat a friend or use as a save up scheme for your interior. Opening Times: Mon - Thurs 8.00 - 5.00 | Friday 8.00 - 2.00 | Saturday 8.30 - 12.30.